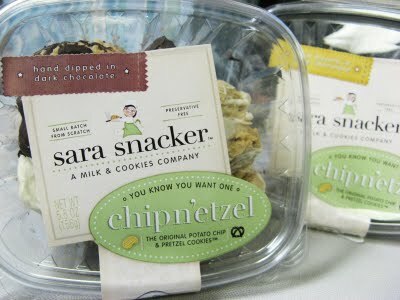 Sara Snacker’s Chipn’etzel: Potato Chips + Pretzel in a Cookie!? The folks at Sara Snacker were nice enough to send over their Original Potato Chip and Pretzel Cookies, trust me, when I first read the cute label, I said *huh? *, just like you must be right now. These aren’t things you usually picture together in one bite. 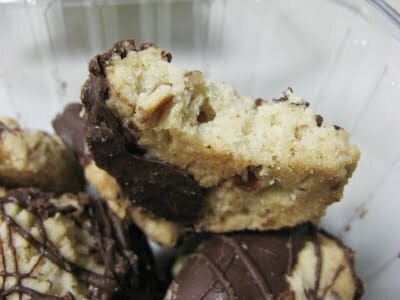 I mean on their own, very popular snacks/junk food, but baked together and then dipped in chocolate? 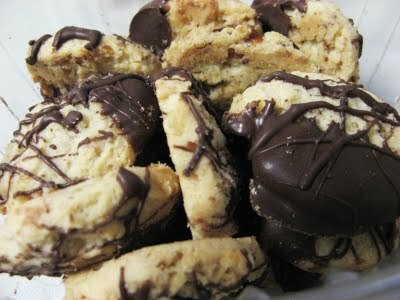 Think shortbread, but not as dense and more crumbly, perfectly buttery, plus tiny pieces of salty pretzels, and a hint of potato chips, covered in dark chocolate. It’s sweet and salty (but not overly of either, just the right balance), then crunchiness pops out here and there, a semi sweet chocolate melts in your mouth (I personally loved the dark chocolate over white, but I don’t like white chocolate in general so that’s very subjective). I like how she covered half, so it wasn’t overwhelming. 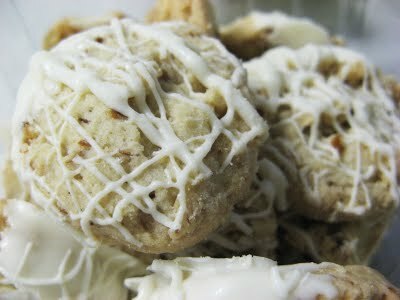 I’m actually eating them as I type, yum! It’s a very unique cookie idea, but I would of liked a little more Potato Chips, I wonder if it melted in the baking?… I thought they were very yummy, but a couple more pieces of chips and pretzel would be even better. Maybe in the future, add some Jalepeno chips? or Black Pepper to give it a kick? I think that would make it even more awesomely addictive. They’re selling them at the Amish Market near me, and since these were “complimentary”, but honestly, I would totally buy the dark chocolate ones again and again (suggested price is $4.99). I’m actually picking up some for my friends Wine and Champagne Party this Sunday. They feel like they were done by hand, with a lot joy and love, small batches made from scratch. No cookie cutter here. Sara, the CEO and owner of Sara Snacker has a sweet story of her own, she was a high ranked tv executive producer in LaLa Land before she moved back to the Big Apple in pursue of her long time cookie passion/obsession. I *heart* these kinds of stories, these are people who put so much of themselves into every box you buy. I love your blog! Thanks for commenting on ours. Would you like to swap links? I would have emailed, but it wouldn't allow me to! Don't be fooled, there is nothing "Homemade" about the Chipn'etzel. These cookies are mass produced in a commercial bakery in New Jersey. but momofuku can't take credit for soaking cereal in milk and selling that… yet ppl find that a "novelty". Before writing this post, I did some research, and from what I read, cookie recipes can't be "owned" by anyone, so they can't claim is theirs, cuz if that was the case, everyone would be knocking off someone's chocolate chip cookie? or oatmeal?….